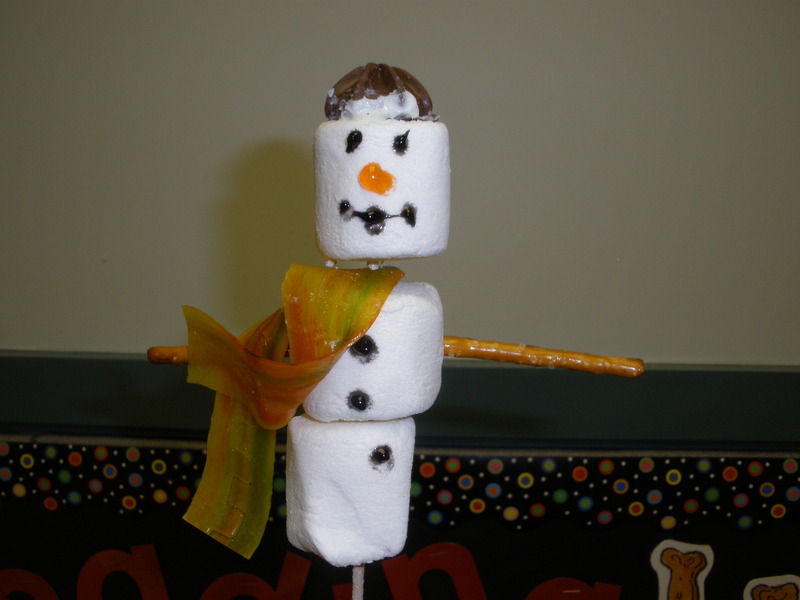 The hot topic among the 6 and 7 year olds this week was ……..snow! Snow in the forecast. It would snow Wednesday night. Will we have school on Thursday? On and on and on……………. Naturally, it didn’t snow. Once again we missed the forecast. Once again some schools and businesses jumped the gun, not for cancelations but for delayed openings. And once again, nothing happened. Disappointed children showed up to school. Little did they know, they would be building snowmen! Edible snowmen! Three marshmellows, a little fruit roll-up, two stick pretzels, a chocolate star, a kabob stick and a bit of icing later and a snowman is born! This entry was posted in Notes from the teacher's desk and tagged early childhood activities, food, lesson plans, Notes from the teacher's desk, parenting, snacks, snow days, snowmen, Weather. Bookmark the permalink.